WebUI, the web user interface you may use to access Colleague will be upgraded to a new version in the next few months. This new version will no longer require the use of Microsoft Silverlight plugin, which means you can use any of your favorite browsers such as Firefox, Chrome or Safari. Please note that WebUI is not TheHub. The current version relies on Microsoft Silverlight plugin which is problematic for several reasons. Foremost, Silverlight is begin decommissioned by Microsoft and will no longer be supported in the near future. Secondly, changes by Chrome make Silverlight mostly non-functional. Lastly, WebUI 5 will now use HTML5, the latest standard for web development. When Will I See the New Version? Over November we will have the new version of WebUI installed in our test environments and users will be notified to try it out. We anticipate installing it in production around Thanksgiving, but that is speculation at this point. You can view highlights and a demonstration at HampTV . Sections (SECT)-Note that SECT has had its detail fields moved, but the field sequence is still the same. If you have questions, send them to colleague@hampshire.edu and we’ll be happy to help you. 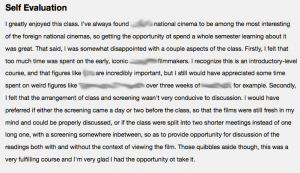 For the last 8 years or so, TheHub has allowed formatted text on evaluations. This includes BOLD, italics, underlining and many others. We realize the need for formatting to properly cite works as well as the ability for superscripts or subscripts to be used in math, chemistry or other sciences. 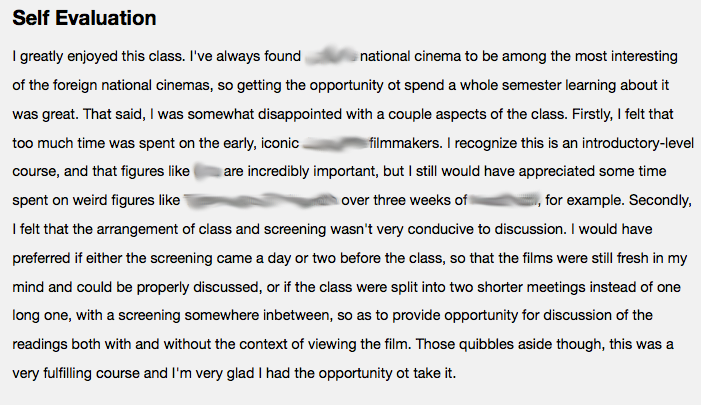 However, one of the problems we have with evaluations on TheHub is lack of consistency in fonts, colors, line spacing, etc. This is exacerbated considering that many like to write their evaluations offline using Word or other editor, and then cut/paste the formatted text into TheHub. By doing so, this introduces a lot of variability in fonts, line spacing and more – which TheHub has been preserving. we will improve the consistency of evaluations for students, faculty and staff who need to read these on a regular basis. The change of seasons is upon us and the life-cycle of the tomato plants at the farm center has me thinking about life-cycles in general. I have been doing some reading lately about the life-cycles of organizations. I found this great GIF on the web that illustrates the challenges faced by maturing organizations. The real question I have is where are we on this curve? I suspect that we are reaching maturity, which in and of itself is not problematic if addressed properly. The key to success in the future will be actually tracking where we are on this curve and crafting a strategy to move forward. The book is a good primer on the subject and one that I would recommend. We will all soon be involved in the planning of the College’s future. New research around ideas like Design Thinking will help us to answer the tough questions as we move forward and allow Hampshire to once again become disruptive in the marketplace. Icons and Notifications: Coming to TheHub! It’s a busy time of the year and we’re trying to push ahead with continuous updates on TheHub to better support faculty and make it easier to know when certain actions are required. To that end, we’re introducing some new icons and beginning to work on proper notifications. In this case, the two students pictured have a Div III contract awaiting your signature. In both cases since you are the prospective chairperson since the Div III icon contains “c”. Shortly, midterm evaluations will be upon us. Recall that midterm course evaluations are required of all first-year students and optional for all other students in your courses. 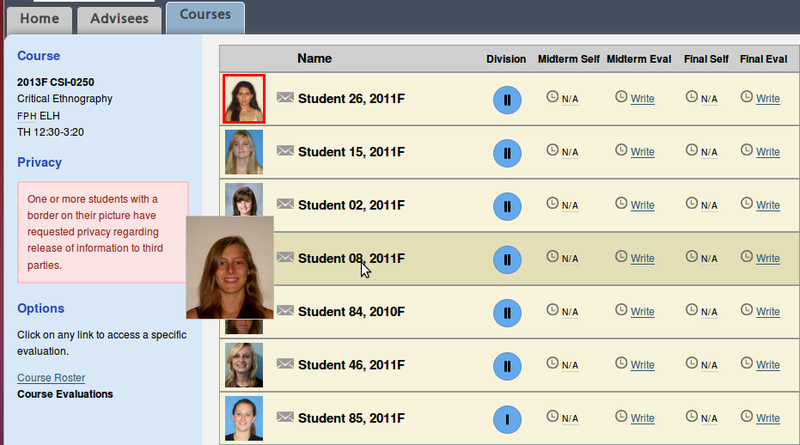 To let you know which students you must write midterm evaluations, we have added the evaluation icon . This is contrast to the Pending icon . Both of these icons indicate that you have not finalized a midterm evaluation for a student, but a midterm evaluation is not required in the latter case. Soon you will start to see notifications on your home screen when you log in. These will notify you of events such as pending filing or evaluation deadlines as well as specific contracts or evaluations which require your attention in a timely manner. As always, please send feedback to thehub@hampshire.edu if you have comments or questions. Many faculty are getting their first taste of the last major change to the interface on TheHub. 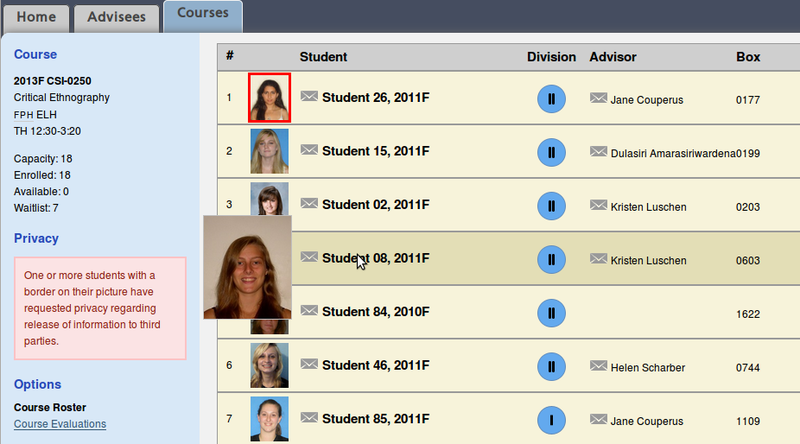 Recently, we introduced the new look for Courses: how faculty access courses, rosters and course-based evaluations. When you log in and click on Courses you’ll get a list of your current (active) and upcoming courses. In the example above, the faculty member has two courses for Fall 2013. Note that courses for prior semesters are not listed. The new version of TheHub will prominently display privacy warnings for your advisees and students in your courses with a red border around the picture and details about the student’s request will appear on any course evaluation. Any faculty member who may be red/green color blind should contact Jeff Butera (jbutera@hampshire.edu) and we can address concerns. To either read or write evaluations for a student, either click Evaluations directly from the Course listing or click the link on the left sidebar of the roster. 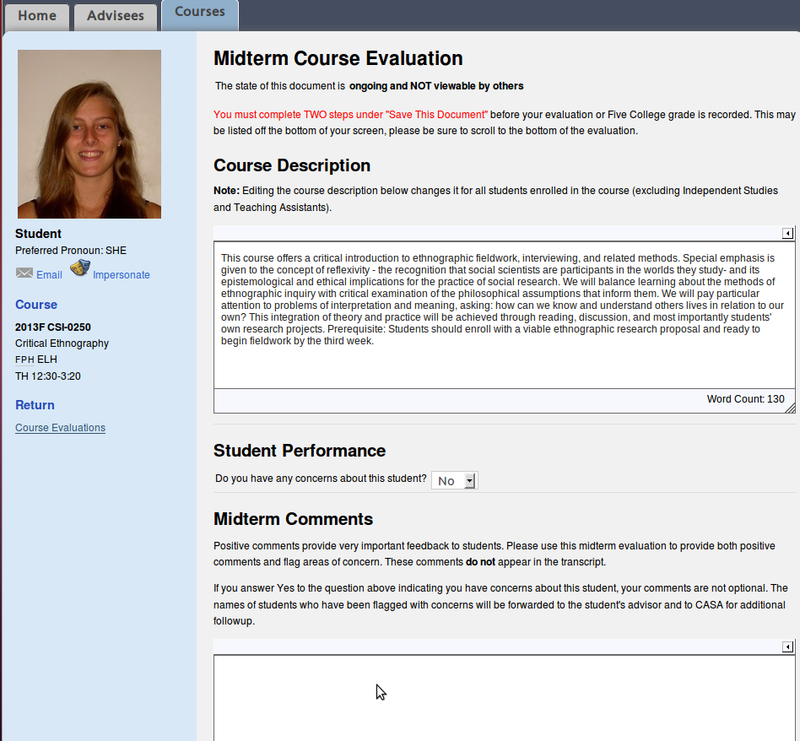 When the evaluation page is displayed, you can see the status of every course evaluation for every student at once: Midterm Self-Evaluation, Instructor Midterm Evaluation, Final Self-Evaluation and Instructor Final Evaluation. Later in the Fall 2013 semester faculty will also be able to view summaries of student assessment of the course and instructor. Advising on TheHub: What do all those icons mean? Faculty will soon have a new interface on TheHub to write evaluations, much akin to that developed on betahub. For those who may not be familiar here’s a summary of advising information and what all the new icons mean. When you log in and click on Advisees you’ll get a list of your advisees. In these examples, student 87 was a previous Div I advisee you passed, and you are chair for his Div II committee. You are a current Div II member for student 66, and current Div II co-chair for student 35. In this second example, you previously served as student 32’s Div II chair (and passed him), and are currently his Div III co-chair. You are the current Div III chair for student 96, and Div II member for student 13. Lastly, you might see “a” indicating you are the non-divisional advisor. This means the student has been manually assigned to you as an advisee by CASA, even if you do not have a Div I, II or III committee relationship with them. By working with students and faculty to develop this listing we hope you find it very simple yet conveys a lot of information in a relatively small space. HighEdWeb New England is being hosted at Mount Holyoke College on Monday, March 18, 2013. What is HighEdWeb New England? What involvement does Hampshire IT have in this conference? HighEdWeb New England is being coordinated by a team of higher ed web folks who work in institutions throughout New England, including Sarah Ryder, senior web programmer at Hampshire College. The conference program includes several presentations from higher ed folks around the United States, including a lightning talk titled “Breaking the Divide for Great Web Apps” by our very own Jeff Butera, associate director of information technology for applications and web services. Five Colleges, Inc is one of the sponsors of this conference, and there are over 30 people from within the five colleges who are attending HighEdWeb New England.